(PhysOrg.com) -- Silicon is an ideal platform for integrated photonic circuits because the material is cheap and readily available. Silicon chips with an integrated laser source capable of emitting light at a specific wavelength are particularly useful in telecommunications. Unfortunately, silicon is a material with high optical loss, which often degrades the output power and performance of the laser source. Yongqiang Wei at the A*STAR Data Storage Institute and co-workers have now fabricated a silicon chip that integrates not only a laser, but also an optical grating that provides optical gain and ensures that the laser outputs light at wavelengths near 1,550 nmthe standard operating wavelength for telecommunications devices. The transmission of large amounts of data through an optical fiber is based on laser beams of different wavelengths that are sent through the fiber all at the same time. For such multi-channel operation, however, the lasers need to be tuned to precise wavelengths to avoid cross-talk. This can be achieved with an optical grating. So far, integrating a laser and an optical grating into a silicon chip has been challenging. The laser is typically made from several thin layers of different semiconductor materials, while the optical grating itself is etched out of silicon. Everything has to be precisely aligned, and the conventional way to achieve this is to grow the laser on a separate semiconductor chip. The whole process takes more than 50 steps and requires the surface roughness of the silicon wafer to be extremely low, less than 0.3 nanometers, says Wei. In the new device, a light source is placed between a mirror and a curved optical grating (pictured). The grating acts like a selective mirror that only reflects light at a specific wavelength back into the laser. 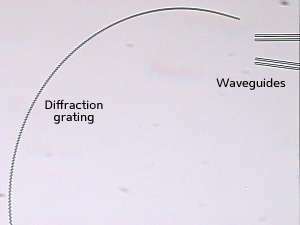 This creates an optical cavity that only allows lasing action at a specific wavelength, providing the precision necessary for telecommunications applications. The researchers tested their device and found that it has good performance, emitting light with optical power of 2.3 milliwattsabout the same power as a laser pointerat a highly specific wavelength. The integration of multiple lasers and optical gratings on a single chip will be our next challenge, says Wei. Also, for practical applications, we plan to scale up our single-wavelength lasers by utilizing the same grating structure for a broader range of wavelengths in order to integrate multiple light sources on the chip. The new device marks a major step toward the realization of commercial telecommunications devices integrated on a single silicon chip. You produce that at a reasonable cost and add WDM and mulitple colors and you have one excellent backplane or a compute system.